We are also highly acclaimed for our services such as offering crockerys for parties. Our crockery is well designed and exotic and are quite appealing. We offer a wide range of plates, glasses, mugs, cups and others that are provided with utmost care by using graded glass. Our glass crockery is available in various designs and can also be supplied as per the requirement by our clients. We provide best bone-china crockery and best quality steel cutlery for your elegant event. So, Make your Wedding a truly memorable one, by availing our services. Crockery is one of the most important part in your marriage and parties. A very well planned function where all the arrangements are a guest's delight can easily leave a bad impression if not complimented by fine crockery for dining or waiter service. Our crockery and waiter service can take these worries away from you by replacing the old look crockery with hi – class bone china crockery. Elegance is added to your party event with the choice of the right crockery. But you cannot buy all the exquisite options available in the market." 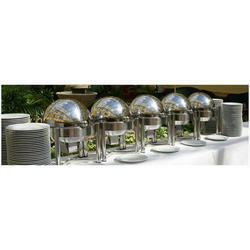 We are also highly acclaimed for our services such as offering crockery’s for parties. Our crockery is well designed and exotic and are quite appealing. We offer a wide range of plates, glasses, mugs, cups and others that are provided with utmost care by using graded glass. Our glass crockery is available in various designs and can also be supplied as per the requirement by our clients. We are providing Crockery for wedding ceremony, parties or any type of functions.